This herby soft velvet textured beauty shows how good modern Dao wines can be. Made by Carlos Lucas who used to work at Dao Sul (with his Magnum Vinhos partners Lucia Freitas & Carlos Rodrigues) - they now run the small 6 hectare Quinta do Ribeiro Santo in Carregal do Sal which was restored by Lucas. The quinta is named after the stream which surrounds the property, once owned by a priest. Set amongst the beautiful pine forests of Dao on the slopes of Serra de Estrela & Serr do Caramulo - the herby garrigue and sweet pine notes are clearly found in this wine. 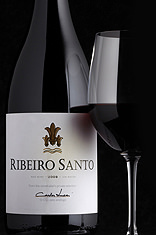 Made from a blend of native Portuguese grapes: Touriga Nacional, Tinta Roriz (the Portuguese name for Tempranillo) & local Dao grape, Alfrocheiro - grown on poor granite soils.